Qualitative Methods in Social Work Research provides accessible, how-to instruction for carrying out rigorous qualitative research. 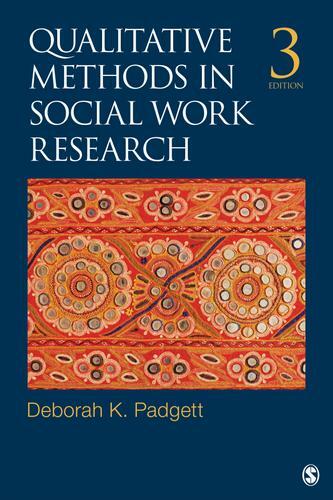 Deborah K. Padgett’s thoroughly revised Third Edition offers a comprehensive introduction to qualitative methods based on six major approaches: ethnography, grounded theory, case study, narrative, phenomenological, and participatory action research. Readers will appreciate the book’s ease of use, friendly writing style, and helpful cases/examples that combine attention to methodological rigor with pragmatic concerns for real-world relevance.